In some earlier posts I’ve described ways to get Netbeans code completion working for CodeIgniter. In this post I will show you how to do the same for Kohana. Kohana is originally a PHP-5 only fork of CodeIgniter, but it has developed into much more. Now all code has been rewritten, so only the framework in concept is based on CodeIgniter. It has nice ORM, AUTH and Cache modules. It’s easy to convert and actually I prefer Kohana, it’s more intuitive and extensible. The only drawback: Kohana needs PHP 5.2+, where CI can be used with PHP 4. Kohana uses the PHP class autoload feature, no need to include class files manually, PHP will lookup the file on the included path automatically at the moment the class is mentioned. The Database class declaration file will be loaded by PHP automatically. 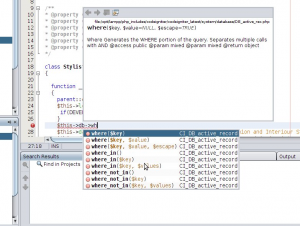 This way of lading classes is also understandable for the auto completion parser of Netbeans. That’s not the case in Kohana, but there is another problem. Kohana uses Class suffixes. The classes are declared like Database_Core, but called like Database (without the _Core). You can see the discussion on which this post is based in the Kohana forum. There is even a script that will generate the file automatically, so it will do extensions aswell. Works for Zend, Netbeans and Eclipse. And it will create a zend_autocomplete.php file in the cache directory. You can move that to the nbproject folder if you want. In an earlier post I described a way to achieve PHP code completion in Netbeans for the CodeIgniter framework. That way consisted of inserting property comments – which functioned as a helper for Netbeans to interprete the use – in every user application controller. This post will describe an even easier way, but first some comments about the earlier post. I showed some ways to automate the inserting of the comments, although writing phpDocumentor comments in Netbeans is supported natively. Just type /** and completion will be available like explained here. It’s a good custom to write comments in phpDoc style, it will help users to understand your coding, and it will offer an extremely easy way to publish documentation about your programs. Read here more about phpDOC. Now were getting to the core of this post. Probably the easiest way to achieve code completion is to put a file in the source path of Netbeans, but out of the CodeIgniter application or systems paths, let’s say a file called `netbeans_ci_code_completion.php`, but you can give it any name you want. It doens’t matter how you call it, as long it has a php extension and is seen by Netbeans but not CodeIgniter. You can save it in a folder called temp, or even in the nbproject (netbeans project folder) folder. I worked for me, and I’ve haven’t noticed any drawbacks yet. Putting it in the nbproject folder has the advantage that the file will not by copied to the server automatically, because that folder is already marked to be excluded in the synchronization settings. Some software you like, you start working with it, and you feel like it’s made for you. Everyday you discover a little bit more of all the hidden powers. That’s the good thing about open source, there is so much power that has yet to be discovered. Most commercial software claim a lot of features in their marketing brochures and disappoint enormously in the end when you start working. Code Igniter is a rapid development framework for PHP, it’s a flexible MVC-like system. 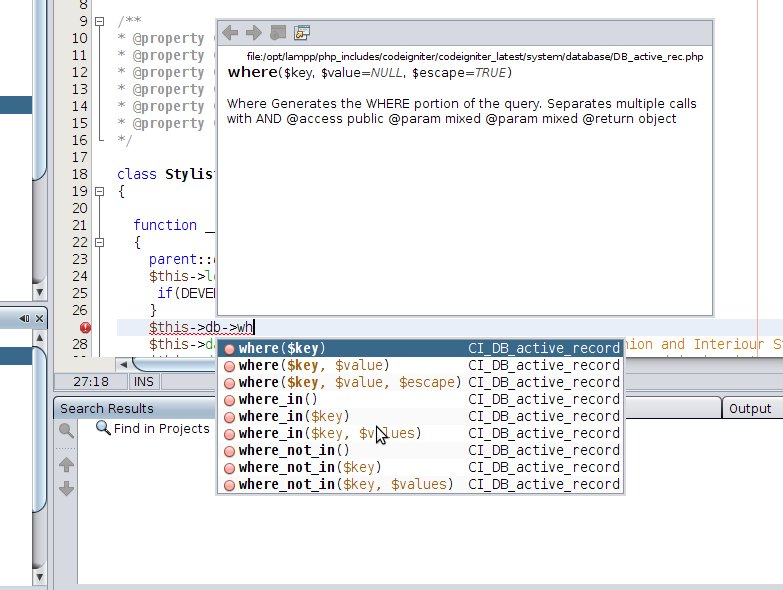 Netbeans let you easily implements CodeIgniter powers, by offering code completion for CodeIgniter’s native Active record classes, libraries and helpers functions. The first step is only neccesary if you have moved the system folder out of the Netbeans project source folder that contains the application folder, in case of a multi site set up or something. This will give code completion for the helper functions and some more, but not for the Active record or database functions in a controller. And you will get all available functions offered. Wow! the Archives of My Beloved PHP for January 2009.